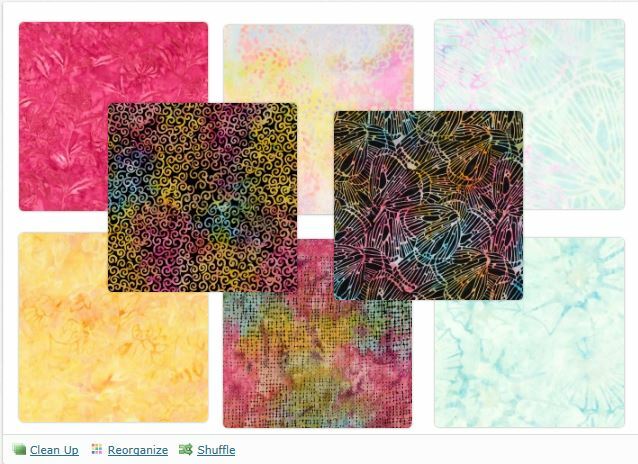 Today the announcement for the July project for Camp Loopy Safari – the fabric version – was announced so the shopping and planning could commence. The challenge for July is to pick six different half yard cuts of fabric (you could use more but that’s the minimum) and somewhere on your project there must be a bit of applique or embroidery. I know I’ve said this before but I love the Project Planner feature that was added to TLE website. You can add fabric (or yarn) and see them side by side and then with a click – it turns into a shopping list so you can edit how much of each one, and another click, it dumps those fabrics with the yardage you listed directly into the shopping cart. I’ve been coveting the fabric that is in the bottom row middle for a while — these are all batiks and I can’t say I’ve ever met a batik I didn’t love — but I especially love that one. I recalled a pattern I had wanted to make and so found the others to go with them. 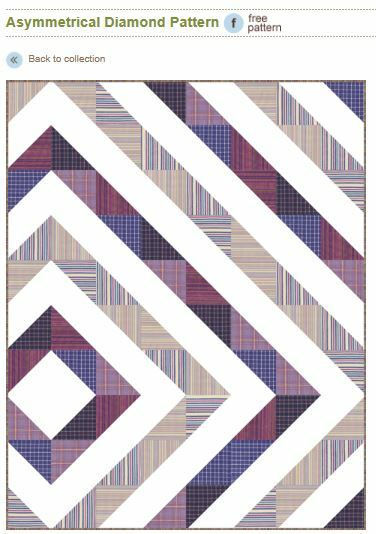 It will be another large wallhanging and look similar to this pattern from the Robert Kaufman website called Asymetrical Diamond. All just simple HSTs. The yellow/goldish batik will be my background (used where the white is in the quilt image), the three batiks with black in them will make up where the darker shades of blue/purple are and the three lightest batiks will be where the lighter shades of blue/purple are in the quilt. The bright pink will be the binding and as for my bit of applique (because you know I will be doing applique rather than embroidery) 🙂 I’m thinking I’ll add a pink heart in the diamond area where the blocks meet to make sort of the center – the asymmetrical center. Either that or one of the prints is butterfly wings so I may applique a few little butterflies flitting across it. So my order is placed and my plan is in place. Now I just have to finish off the June project and then wait for July to start this one. But, at the last minute, I decided to give myself a three-day weekend, so I should have my final border area quilted in no time tomorrow and get the binding on and hopefully have a totally finished project done before the end of the weekend.